This proposal will provide IPv4 and IPv6 addresses for all containers (pod network) and nodes (management network), allowing communication with other pods and external resources with either protocol. To simplify this first release will use a single IP family for services, meaning the service network will either be IPv4 or IPv6. We’ve started implementing some changes to support dual-stack (as WIP, in some cases, because the KEP is not approved yet). To support that, I’ve modified the kubeadm-dind-cluster provisioning tool (a.k.a k-d-c) so that we can experiment with bringing up a cluster with dual-stack networking, during development. The changes include setting the CNI configuration files for dual-stack, adding static routes for the Bridge or PTP plugin so that pods can communicate with either IP family across nodes, adjust the KubeAdm configuration file so that the API will use a specific IP family, and does not make use of the DNS64/NAT64 capabilities as both IP families are available on each container. 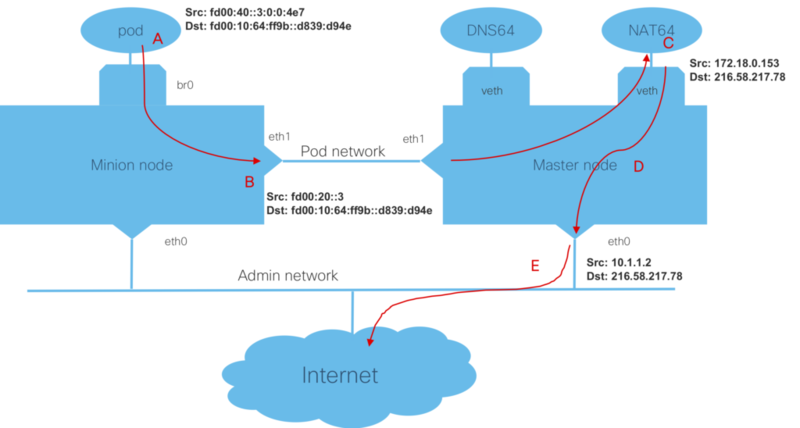 I’ve verified that we can bring up a cluster in dual-stack mode, with pod to pod (across nodes) and pod to external connectivity using both IPv4 and IPv6. I’ve used IPv4 for the service network, and with PR 70659 (under review as of today), I have verified a cluster with an IPv6 service network. Granted, there are things that don’t work yet, as much of the KEP needs to be implemented (like service endpoints and pod status API), but it was very satisfying to see a PoC cluster come up. To try this out, there are a few preparation steps. First, clone the kubeadm-dind-cluster repo. If you are in a lab, and need to use a company DNS server, you can also set REMOTE_DNS64_V4SERVER. Then, just use the same “up” command to bring things up. In each of these modes, you’ll see either IPv4 or IPv6 addresses, when doing a “kubectl get pods –all-namespaces -o wide” command. The pods will still have both IPv4 and IPv6 addresses, and from the pods, you’ll be able to ping and ping6 to external IPv4 and IPv6 sites, respectively. I haven’t played with external access to the cluster, and obviously there is work to do for the APIs and kube-proxy, along with changes to kubeadm (see the KEP for details). I’m working on updating my Lazyjack tool that helps with provisioning Kubernetes on bare-metal nodes, so that it too can bring up dual-stack clusters. This will provide feature parity with k-d-c, only using separate physical nodes, instead of Kubernetes running on node containers (using Docker-in-docker) on a single host. With current Kubernetes IPv6 only clusters (v1.9.0+), a brute force approach was taken, to deal with the outside world. Since there are some external sites that are IPv4 only, Kubernetes was set up with a NAT64 and DNS64 server to treat all external destinations as IPv4 only. Here, we’ll talk about ways to more intelligently handle external sites, using IPv6 access, when possible. The result is an improvement in performance, both in space and time. 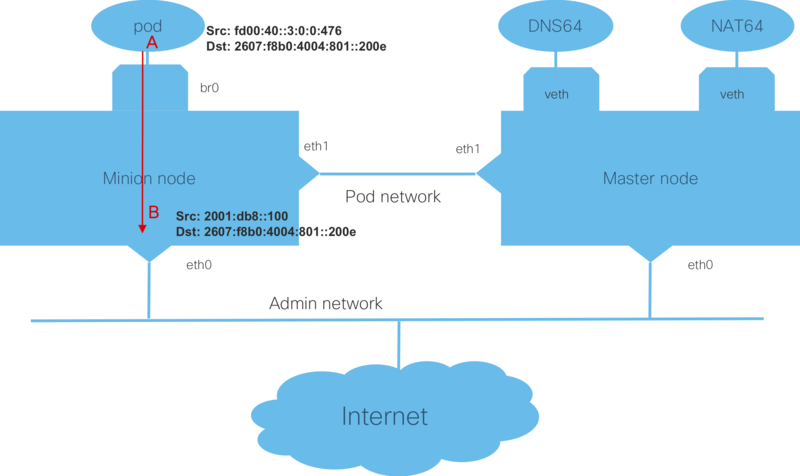 Let’s use an example of a pod on a minion node of a three node, bare-metal, IPv6 only Kubernetes cluster, trying to ping google.com. First, the pod requests a lookup of the destination name, to obtain the IP address. Since not all destinations support IPv6 (e.g. github.com), the DNS64 server in the cluster is configured to always use the A record (IPv4) and ignore any AAAA record (IPv6). The IPv4 address will be embedded into a synthesized IPv6 address, using the configured prefix. In this example, the address 216.58.217.78 is combined with the fd00:10:64:ff9b:: prefix to get fd00:10:64:ff9b::d83a:d94e. The pod (fd00:40::3:0:0:4e7) will then send a ping request, out it’s interface (to fd00:10:64:ff9b::d839:d94e), as shown at (A) in the diagram below. The ping request will cross the local bridge, br0, and the routing table on the node will direct the packet, over the pod network, to the master node. The packet will be sent (B) from the minion node’s eth1 interface (fd00:20::3) to the master node’s pod network interface (eth1). The route on the master node, will direct the packet to the NAT64 server (a container), over the veth interface. The NAT64 server (C) creates mapping of source IPv6 address (at this point the minion node’s pod network interface fd00:20::3) to a private IPv4 address (172.18.0.53) from a locally maintained pool. It will extract the destination IPv4 address (216.58.217.78) and send the ping to the master node (D), where iptables employs SNAT to map the private IPv4 address to the node’s IPv4 address (e.g. 10.1.1.2). Finally, the packet is sent out the main interface (E) to the next hop, which would also do SNAT for this local IPv4 address. The ping response would follow the reverse route thought the NAT64 server, to the minon node, and finally the pod. We can, however, configure the DNS64 to allow AAAA records to be used, for external destinations that support IPv6 addressing. In this example, the DNS lookup would return the AAAA record for google.com (2607:f8b0:4004:801::200e) and the pod shown at (A) would send a ping to that address, as shown in the diagram below. The ping request would traverse the local bridge, br0, and the routing table on the minion node would direct the packet out the main interface (eth0), and using SNAT, would use the IP of the node as the source address (2001:db8::100), as shown at (B). The packet would be sent to the next hop, where SNAT may occur, if the minion node’s IPv6 address is not public. The ping response would follow the reverse route, into the minion node, and to the pod. This avoids sending the packets to the master node’s NAT64 server, where translation and mapping is performed, both a time and space savings (no mapping table needed). The Lazyjack tool has been modified (in v1.1.0+) to allow the user to specify whether or not destinations that support IPv6 addressing can be directly accessed, without using NAT64. Under the dns64 section in the config.yaml, there is a new entry titled “allow_aaaa_use”, which if set to “true”, will use the AAAA records from DNS64 and directly access external IPv6 addresses. If omitted, or set to “false”, the existing mechanism of using only the A DNS record and performing NAT64 on all packets for external destinations. Enabling IPv6 and IPv6 forwarding on main interface. Giving the main interface (with Internet access) an IPv6 address (we used SLAAC). Having a default IPv6 route that sends traffic out the main interface (done via SLAAC). As of PR 148 merging, the Kubeadm-dind-cluster tool (note the new repo location) for provisioning clusters has been updated to allow the user to enable the ability to use (IPv6) AAAA records for DNS lookups, so that unaltered IPv6 addresses can be used, rather than forcing the use of (IPv4) A records and requiring DNS64 to be used. This new capability can be enabled by setting the environment variable, DIND_ALLOW_AAAA_USE=true. The k-d-c tool will then use a modified DNS64 configuration, and create the needed ip6tables entries on the host to allow forwarding of packets to the kubeadm-dind-net bridge, and perform SNAT for outgoing packets. You can check the PR, and once merged, use the latest code on the master branch. In working with my lazyjack tool to create IPv6 based Kubernetes clusters on bare metal systems, I wanted to run the latest code on master (1.10.0-beta.2 at this time) to run E2E tests and possibly tweak things. So, I needed to be able to run KubeAdm with my own repo, instead of using something prebuilt from upstream. In addition, I wanted to make sure that I could do some customizing with lazyjack. As described in my blog post on lazyjack, I have a three node, bare-metal setup, with a second interface connected to a physical switch, for the Kubernetes management/pod network. The lazyjack tool is installed on the nodes and I have a config.yaml with the network topology, including all IP addresses desired. Developement tools (go, git, etc) are installed on the node used as the master node. I’m using Ubuntu 16.04 on each of my systems. Now, we are ready to set things up to use this repo, for the Kuberentes cluster. I copied these three binaries over to the two minion systems, placed them in /usr/bin, and restarted kubelet to update them as well. I guess I could have used the management IP for the master node ([fd00:20::2]), but I decided to use the admin interface IP of the machine on the lab network. In this case, it was 10.86.7.77. You would replace this, with your master node’s IP address. Before invoking “y”, you need to pull the “hyperkube-amd64” line (first one? ), as it already has the right suffix. Now, you can invoke these two files and create all the tags needed. Now, I don’t know if you need the tags in file “x” (other than the hyperkube-amd64), so you could try skipping running that file and just do the first line, along with running file “y”. In my Kubernetes cluster, I think all the images had the -amd64 suffix. As you can see, I didn’t have the etcd image, and had to pull it first. You can check with “docker images” to see if you have to pull any images, before tagging and pushing. Note: For some systems, I’ve had to pull from k8s.gcr.io instead of gcr.io/google_containers. The versions of etcd and kube-dns that KubeAdm uses are hard coded in the code, so I had to find out by trial and error. Looking at logs, I noticed that these pods were not coming up, and saw what image versions were being tried in the pulls (e.g. 10.86.7.77:5000/etcd-amd64:3.2.16). I would then, do a pull of that version from k8s.gcr.io or gcr.io/google_containers and push it up to my local repo. To bring things up quickly, I’m using a current release (v1.0.6) of my lazyjack tool, but you can do the same manually, if you’re a masochist :). I installed it in /usr/local/bin so that it is in my path. I created a config.yaml for my setup to represent the topology and addresses that I wanted to use (see lazyjack README.md for details on this file). I ran “sudo lazyjack init” to create the certificates needed and place them into the config.yaml file. I copied this updated YAML file to the minion nodes, which also have lazyjack installed. Next, I ran “sudo lazyjack prepare” on the master, and each of the minion nodes. There should be bind9 and tayga containers running on the master, for the DNS64 and NAT64 servers, respectively. This step will also create a kubeadm.conf file in the work area. Run kubectl and make sure that all the pods and services are up and running. Then, you can run the “up” command on the other nodes and check with kubectl that the nodes area “ready” and the additional proxy pods are running. You should be able to then use your IPv6 based cluster, running code from your local repo! Please be sure to use docker version 17.03, as versions 17.06, 17.09, 17.12, 18.03, and 18.04 are showing that, even with the host enabling IPv6, any containers created have IPv6 disabled. The effect seen is that the kube-dns pod is stuck in “creating” state, and logs show that the CNI plugin is failing to add an IPv6 address to the pod (permission denied error). This is true with any user create pods that use the pod network and need an IPv6 address from the CNI plugin. This is discussed in this CNI issue and in this docker issue. Since I was able to get a Kubernetes cluster running with IPv6 only on bare metal, the next logical step was to give a go at trying to bring up Istio. Like the Star Trek movie, this was something untried, and my goal in this blog is to document my efforts to try Istio on IPv6 as a Proof of Concept (PoC). Spoiler: I have it working, but the road to make this a reality, will take quite a few code changes. Update: Had presented a summary of IPv6 readiness at Istio Community Meeting 3-22-18 At 15:55 mark. This isn’t for the faint at heart, but I’ll try to make it as cookbook as possible (granted, I need to verify this on a fresh setup, in case my memory failed me on some steps). That said, I expect that you have bare metal systems available, network topology set up, needed tools installed (e.g. Go, GIT, docker, lazyjack), accounts set up on github.com and hub.docker.com, and have installed the Kubernetes that you want to use (1.9+). For my setup, I have three Ubuntu 16.04 machines, each with IPv4 access to the outside, and a separate interface connected to a switch for Kubernetes management and pod networks. Go is at 1.9.2. I have a cloned Kubernetes master branch on February 14th, 2018 (commit f33e0b3), and built all the needed apps. Kubectl, kubeadm, and kubelet are at v1.9.3 and placed in /usr/bin/. It’s not critical to have the latest and greatest here, as long as it is 1.9+ code. For Istio, I tried to use the path of least resistance and decided to use NodePort, instead of LoadBalancer, and not to use authentication. I plan on trying MetalLB that I previous tried on a IPv4 cluster. Everything needed for this setup, was done by LazyJack in about five minutes, and worked just fine. I have a Kubernetes cluster running IPv6. Now, let the hacking begin! You would want to substitute “pmichali” with your github.com and hub.docker.com username (I did same for tag name). Do a “docker login” to your hub.docker.com account, so that pushes will work later on. I checked out the latest from master and built everything. In this case, I’m using commit 18a20f9 from March 4th, 2018 and used a separate branch. Here’s were the fun starts. Several changes are needed to support IPv6. It’s not really that many, however, there are a few changes that, to make them permanent, will require some larger effort. In addition, changes are needed to the sample apps, like BookInfo. As a starting point, I have a fork of Istio, where I’ve created an ipv6 branch that is based off of the March 4th, 2018 commit on master (18a20f9). You can take the latest commit (6299579) off of the ipv6 branch, or cherry pick the ones you want. I’ll make issues and submit PRs to Istio for the easy changes that I’ve made. The first patch (commit a5451cd) modifies validation of proxy addresses in Pilot, to accept IPv6 addresses correctly. The second patch (commit 0502713) changes the hostname to IP resolution in Pilot, to add the needed square brackets to IPv6 addresses (separating the port from IP part). The third patch (commit e7e5d48) changes the bootstrap code, so that it can parse IPv6 for Pilot discovery, Zipkin, and statsd addresses that are stored in config. The other bootstrap code patch (commit 21b82c4), changes a JSON template file, which has the side effect of altering the output of the test files. As a result, the patch also includes updated golden files, so that unit tests pass. For this to be upstreamed, we need to be able to test bootstrap with both IPv4 and IPv6, and have a way to allow deployment of the template file in either mode. For the Envoy Pilot JSON file(commit 65dc3e9), the IP addresses are patched to use IPv6 addresses for localhost and any host. Like the previous patch, IPv6 is forced, and to upstream, this needs to be configurable, so that users can use either IPv4 or IPv6 mode. There are two constants in Istio, which specify the wildcard and localhost addresses. This was patched (commit 814036f) so that IPv6 addresses are used. Like the one bootstrap change, this affects the output of the golden files, so they are included in this commit (quite a few of them). Again to make this upstreamable, this should be configurable, so that users could enable IPv6 mode and use IPv6 addresses everywhere. I forgot to run lint, before each commit, so I did another commit (commit b7302ab) to fix those warnings, although the actual upstream commits would have to fix these warnings, and do a cleaner fix than the quick and dirty changes I did. That is it for the base Istio code. We’ll talk about the some of the sample applications later in the blog. I edited install/kubernetes/istio.yaml so that it uses NodePort, instead of LoadBalancer (search and replace), and uncommented the line selecting port (32000). I’d be remiss, if I didn’t spin up the BookInfo app. After monkeying with this for a while, I realized that this app also needed some changes as well. I did another patch (commit 4ea619d) that changes the bind address to “::” for book info, so it is listening on the the right IP/port. Also, since I was modifying the app, I needed a way to modify the images that were created, to use my changes. I updated the build_push_update_images.sh script to push the images created, to my repo (instead of docker.io/istio). To upstream, this app needs to be modified so that the user can select between an IPv4 and IPv6 variant. This app should be modified so that the IP mode is configurable. To bring down Kubernetes, you can use “sudo lazyjack down” on minions and then master mode. Follow this with “sudo layjack clean” to remove everything related to the provisioning for Kubernetes. I was noticing that, with the BookInfo app, I could “curl” to port 9080, using the service IP and the pod network IP, but I was unable to curl to the app from port 9080 using the node IP address. Also, the service didn’t show a nodeport for BookInfo, and using 32000 did not work either. I didn’t see the NodePort type called out in any of the YAML files. I not sure if there should have been a nodeport defined or if that should work. With the helloworld app, I could access it from port 5000 using the service and pod IPs, and from port 32677 (shown for the service) using the node’s IP. This worked as expected. The needed code changes will be easy, in fact, I plan on cleaning up what I have (and adding UTs for the changes). For the JSON and YAML file changes, some form of templating mechanism will be needed to allow operation in either IPv4 or IPv6 mode. Also, if you run the updateVersion.sh script, you’ll need to make sure that istio.yaml has NodePort set, instead of LoadBalancer, and the port 32000 line uncommented. Some thought will be needed on how to setup the samples for either IPv4 or IPv6 mode of operation.